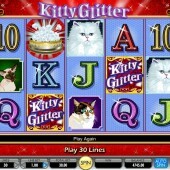 The Kitty Glitter slot has lots in common with the cute and cuddly cats that grace its reels. It is elusive, fun to play with and extremely temperamental. Anyone that keeps cats might know what I am talking about here. If you are looking for Kitty Glitter in a casino it is sometimes hard to come by and you are more likely to stumble upon it when you are not looking for it. 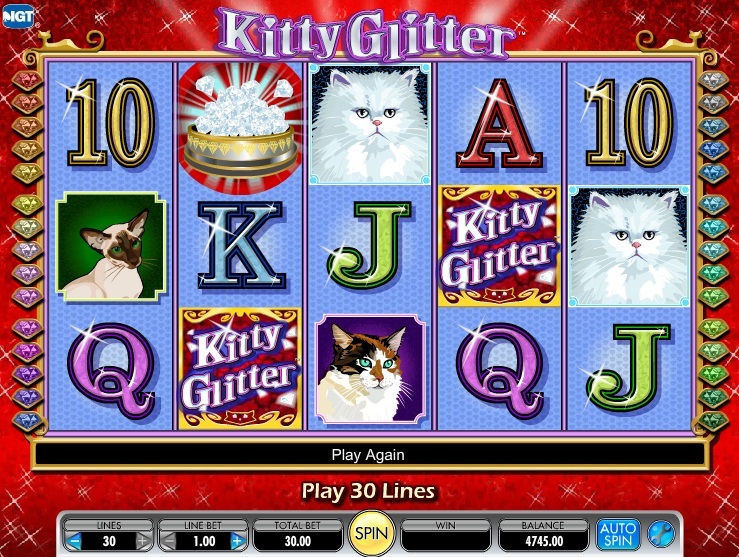 IGT, who make Kitty Glitter, have released an online version of the slot, which is very similar to the land-based version. This will be music to the ears of those players that have experienced the land-based version of Kitty Glitter on the casino floors. However, if you are yet to sample this slot in the casinos then take it from me, it's a timeless classic. I find the normal game in Kitty Glitter can be quite hard to win anything substantial, but the free spins bonus can be very rewarding. You need to land 3 scatters across reels 2, 3 and 4 to trigger the bonus round. This will release 15 free spins at 3x multiplier. As an added extra you can pick up extra wilds during the free spins. This is done by accumulating diamonds on reel 5, which are added to one of the cats at the foot of the game. Get 3 and this will add an extra wild symbol to the reels. There is a maximum of 4 extra wilds you can achieve, which seems impossible in 15 spins, but the free spins can retrigger more than once. I have to admit I have never activated 4 of the extra wilds and normally get 1 or 2 if I am lucky. There are several slots from IGT that require scatters to appear on reels 2, 3 and 4, like the ladybug-themed Lil Lady slot and Cats online slot. If you prefer slots where you only need to see 3 or more scatters anywhere on the reels then you might prefer the legendary Cleopatra slot or the gameshow-inspired 100,000 Pyramid slot. Kitty Glitter is one of those timeless classics and even though at first glance it might not appear to be an online slot that might attract the gentlemen of the casino, there is more than meets the eye. It is a classic for a reason and you will be well worth your time checking it out and trying a few spins before you cast it of as "one for the ladies".